I had never been involved in a fandom before I fell in love with NCIS: Los Angeles. Over the seasons, I’ve made friends here. Some are still as passionate as I am about the show, while others have moved on to new obsessions. It made me wonder about the current level of enthusiasm in the fandom as a whole. Are we as strong as we once were? Why or why not? As we come to the start of Season 8, I set out to answer these questions. I compiled a few statistics and then asked some wikiDeeks contributors and other NCIS:LA fan fiction writers about their experiences. 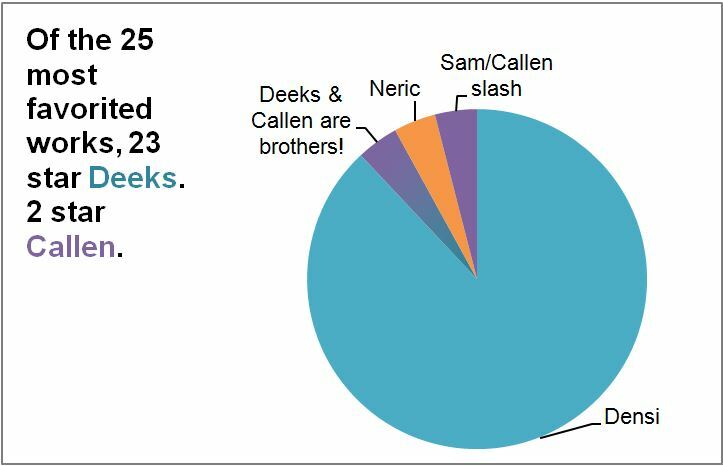 Today we’ll look at the numbers, and in Part 2 we’ll talk to the fan fic writers. Don’t be too afraid- there are just a few graphs! She told me size doesn’t matter. Despite its lengthy run, far longer than most television shows achieve, NCIS:LA has not been as successful at inspiring fan fiction as some other procedurals with much smaller ratings or shorter runs. The mothership, NCIS, dwarfs NCIS:LA’s total, with seven times the stories. 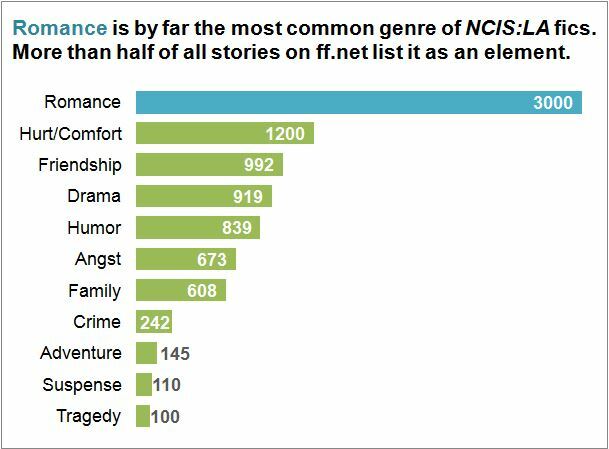 And for further reference, while NCIS:LA has generated 5600 stories and NCIS 39,500, Harry Potter, the largest fan fiction topic from any category, stands at a whopping 748,000 stories. So I’d say the NCIS:LA fandom is relatively small. Tonight? Tomorrow. And the day after. So although there’s been a small uptick in works posted to AO3 over the course of the series, the total number there only represents a fraction of those on ff.net. Plus some writers post the same stories to both sites, making the AO3 numbers even less meaningful. In other words, migration to a new platform doesn’t seem to be an explanation for the overall decline in story volume. Still, Callen fics over time have remained relatively unchanged, even through the peak of Season 5. Deeks and Kensi have really driven the overall level of fiction writing. Deeks and Kensi dominate the list of most favorited stories on ff.net. The list also reinforces the notion that everyone loves at least a little romance. Of the top 25, all but one involve a romantic pairing. The one that doesn’t tells the story of Deeks and Callen discovering they are brothers. So where does that leave us exactly? It would appear that Season 5 was a big turning point in terms of fan fic writers’ enthusiasm. It could be due to the quality of the content. That the drop continued after Season 5 might be related to the Season 6 move to Monday nights, which resulted in lower audience numbers. Perhaps, given the importance of romance, Deeks and Kensi getting together made those will-they-won’t-they stories feel irrelevant. Or it could just be a natural trend for every show as it gets older. As we look forward to Season 8, what exactly is the state of the NCIS:LA fandom? That’s a pretty subjective question, but there did seem to be consensus among our panelists. Most commented that the fandom is still active, but smaller or quieter than in years past. Colette (AKA homegrownoregano) and Gayle (AKA Densiland) both noted a lack of hiatus activity such as collective re-watching or challenges. The reduced size has in itself affected Apryl’s enjoyment of the show. “The fandom being smaller has diminished my enthusiasm a bit. There are not as many discussions going on or fanart and fanfic being made,” she says. In Part 2 we’ll talk in more depth with our fan fic writers to find out what, if anything, has affected their enthusiasm for the show. We’ll hear from a couple people who’ve left the fandom altogether, and from some who are as enthusiastic as ever. Did Deeks and Kensi getting together dampen excitement? What about the whole Internal Affairs investigation and Deeks’ lies to Kensi? And what about our interactions with one another? Have we been playing nicely when debating the merits of the show? In the meantime, do you have any theories about why fan fiction writing volume has dropped so dramatically? And how do you rate your current level of enthusiasm for the show? If you’re interested in seeing more examples of fandom-related statistics (not NCIS:LA-specific), check out toastystats.tumblr.com. Many thanks to wikiDeeks Founding Editor Diane and Contributor Tess for reviewing a draft of this article. You are amazing and I am seriously impressed with all those charts. I am still one of the enthusiastic fans, and I can’t help thinking that the beginning of the new season will entice some fans back, since it will involve Densi. Hopefully the first few episodes will inspire more fan fiction writers and bloggers to post new content. I hope the move to Sunday will improve the show’s numbers…I’m already worried about Season 9…and yes…I am obsessed. Season 9? Lindy you are stressing me out, LOL. Sorry I haven’t read the entire article yet; time issue today. However, my two cents about FanFic is that, for me at least, the FanFic writers are better than the writers on the show! Which is frustrating. The writing is so great; you really get into the story and characters. At some point it does become frustrating because what FanFic writes and what the show produces are so different. So for me, lately I’ve had enough frustration in my life, for now; I’ve pulled away just a bit. I do love the show! It feels like its just almost perfect; like the show finally found its groove. I hope to see many more seasons that is for sure!! As always I love WikiDeeks!! Sorry everyone for my tardy replies- I’m currently traveling with only sporadic Internet access. I’m also responding on my phone so please forgive any typos. Olapa53, I love the fan fiction too. I think it’s spoiled me in some ways because the DC writers can go beyond the bounds of a 42 minute procedural and give us so much more, in terms of both character and genre. If only the show had as much flexibility! And yes you’re right, this is a Deeks site. We try our best to welcome all opinions, but those who dislike our favorite character shouldn’t be surprised if few people agree with their views. PS; If you’re referring to people coming into the forum after a show I will admit I pulled back from that a bit also. Mostly this is a WikiDeeks site; get it people! Some viewers came on to rock the boat, be argumentative, etc. not my style. It was fun; I hope it continues to be fun. I’m not trying to censor people but REALLY! This is a site for Deeks lovers! Count me in as an enthusiastic fan! I loved season 7 thought it was one of the best , am looking forward to season 8, and hopefully nine. I appreciate all your numbers. As a data person, I think you are certainly giving us the state of fan fiction, however, I think it is really only a part of the fandom. I certainly have lots of friends who have watched the show from the beginning and have no idea what fan fiction even is. It also seems like there are a lot of new, young, international fans, and I am not sure where they really post their stories if they write them. Part of being in a fandom is people come and go for personal as well as show reasons, I have to be honest, I do not really have much interest in reading about why people are no longer in the fandom. It is good they are happy , but they have moved on.. It is a natural evolution.I would much rather see this site focused on folks who are still active in the Deeks fandom and have ideas that maybe be critical of the show but the fans are still invested in the show being successful and really still like our Detective Deeks! Hey sassyzazzi, thanks for your comments. I agree that ff may not be the best way to assess enthusiasm. I’d have much preferred to look at Twitter and tumblr but couldn’t access that data. I did look at wattpad as a potential source for ff from younger writers but there was almost no NCISLA work there. I didn’t research any international alternatives to ff.net and AO3- that would be so interesting to know about that type of activity happening elsewhere! I will say that I invited a couple of writers whose work I admire and who seemed new to the fandom to participate but they declined. Being new to fandom, I was actually surprised to see people who seemed so passionate about the show have their feelings changed, so I wanted to find out more about it. I love your idea for a story about our longtime writers- I’ll definitely add it to my TO Do list. Keep those ideas coming! After 7 seasons I am still a very enthusiastic NCIS LA fan. This is not the first show I watch, and it won’t probably be the last, but it’s the one in which I have been invested the most. While for other series I just watch the episodes, period, of NCIS LA I like to follow spoilers, enjoy behind the scenes photographs and information, speculate about what might happen in future episodes, read fanfiction and write some comments here or fanfiction reviews. No other series has had this effect on me so far, but I am glad I still have this “obsession” to keep me company in a world where passions seem to be very quick to change, almost disposable. On the contrary, I am usually quite constant and loyal. Once I have found something that interests me and gives me motivation, I stick to it. The only thing that sometimes has frustrated me about this show is some plots and some writers’ choices. The most meaningful example, for me, was when in Season 6, before All in, we didn’t know where Deeks and Kensi stood. That was one of the lowest points of the show in my opinion, together with Deeks returning Kensi her knife without a clear and consistent explanation. I honestly don’t know if Deeks and Kensi together has made the number of fans of the show decrease for lack of interest, for me it’s been the opposite: I had been looking forward to their “next level” so much that when it happened for real, it was extremely rewarding. And how their relationship was dealt with in Season 7 was extraordinary: adult, mature, genuine, but still with its trademark of banter and funny moments. Thanks Wikideeks staff for providing a place where we can leave our thoughts and opinions. I am very grateful to all of you. Cladani, all I can say in response to your comments is Yes! I totally agree with everything you said, from the unique way the show has affected me to the huge frustration with Season 6 Densi, to the happiness with the current version. So much hard work went into this great article. Love our smart fandom! Thanks Tess, and thanks for participating! I love this site and the chance to be able to express our thoughts on the show. I have said before the ONLY reason I watch the show is because of Deeks and Eric Christian Olsen. I love the Densi relationship but I have to admit was not a fan of Kensi. I think she has become more likeable for me now she is with Deeks. Season 7 has been the best for them in my opinion with us finally seeing them together as a real couple. I think their relationship is more fun to watch now then when they were dancing around each other before. (And I think the show has finally realised how incredibly popular these two are together). I do think that the show still has problems with the storyline consistency. I still don’t feel that Deeks gets enough respect from Callen and Sam, but it seems to depend on who has written the episode. You only have to look at the number of fan sites on Deeks & Densi to see how popular their fan base is. (I have recently created a Deeks fan facebook page) I enjoy reading the fan fiction as well. There are some clever writers. Thank you again for having this fantastic site for us obsessed Deeks fans! Donna Marie, kudos on your Facebook page- another indication that there are still plenty of enthusiastic fans out there. Thank you. I love Deeks but all credit goes to the amazing Eric Christian Olsen.